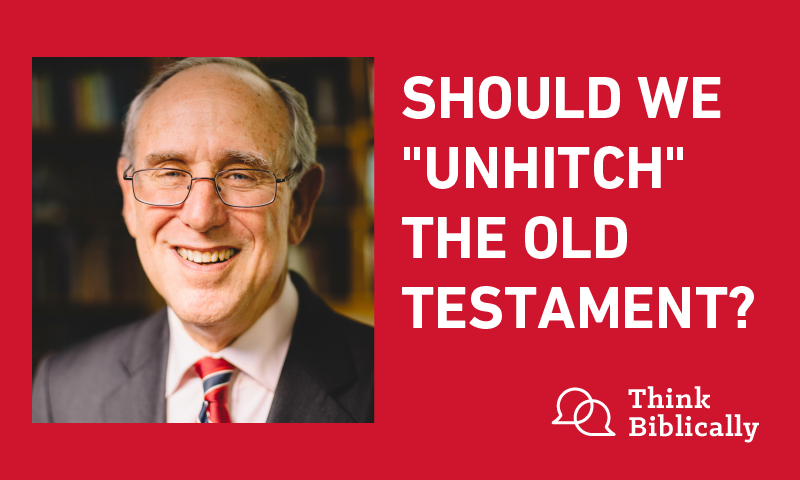 Should We "Unhitch" the Old Testament? Pastor Andy Stanley recently gave a sermon in which he suggested that Christians today should unhitch the Old Testament from our faith. Scott and Sean interview Messianic Jew Mitch Glaser for his thoughts and insights. They discuss the Jewish roots of the Christian faith, the relationship between the OT law and today, and provide some perspective and insight to the controversial sermon. Dr. Mitch Glaser is President of Chosen People Ministries, in Brooklyn, NY. He also serves as a faculty member in Talbot’s Messianic Jewish Studies Program, also in Brooklyn. He holds an MA from Talbot and a Ph.D. from Fuller Seminary. Scott Rae: Welcome to the podcast Think Biblically: Conversations on Faith and Culture. I'm your host, Scott Rae, Dean of Faculty and Professor of Christian Ethics here at Talbot School of Theology at Biola University. Sean McDowell: I'm your cohost, Sean McDowell, Professor of Christian Apologetics at Talbot School of Theology, Biola University. Scott Rae: We're here today with our guest, Dr. Mitch Glaser, who is the President of Chosen People Ministries, which is an evangelistic outreach to Jewish people, not only in the united states but around the world. We have asked Mitch to come on with us because we want his reaction to a sermon that has gotten a lot of attention here in the last couple of weeks. It was preached by pastor Andy Stanley, who is the Senior Pastor of a mega church outside of Atlanta, Georgia, that has a number of church plants attached to it and he said some pretty controversial things, Sean. I'd like to quote a couple of things, and we want to give this the most charitable read that we can right from the start. I'm using his words, not our paraphrase of these. Scott Rae: I think the big idea that Andy was trying to get across was that in the early church, particularly in Acts 15, as a result of the Jew/Gentile controversy in the early church, as he put it, "The church leaders unhitched the church from the entire world view value system and regulations of the Old Testament. They detached the church from Judaism, saw Judaism only as a means to an end, that the prophets predicted and Jesus claimed to have fulfilled it." He goes on to mention that the Jewish scriptures are the backstory only to the main story of the cross and resurrection of Jesus, and that Peter, James and Paul elected to unhitch the Christian faith from the Jewish scripture. Scott Rae: One of the ramifications of this was his statement that we are no longer accountable to the Ten Commandments, they are not our commandments for today, they were commandments for Old Testament Israel, and that through the Jews part of the biblical story, Stanley said, is now over. I think a fairly controversial idea for those of us who believe in the divine inspiration of the Old Testament. It constitutes three-fourths of the scripture, which is an awful lot of material for something that's just the backstory. But, Sean, I think the most charitable read on this is that Andy was trying to help people today overcome some of the obstacles to coming to faith and staying in a vibrant Christian faith that he views the Old Testament as presenting. Sean McDowell: I think that's right and it's important to approach this charitably for a few reasons. Number one, we should just always approach people charitably and try to assume the best and, second, Andy Stanley has a remarkable history of preaching the gospel, being faithful to scriptures, and his family, as well, so he deserves the benefit of the doubt. I think as we look at this issue, it's important to keep in mind that he's not primarily a theologian. Now, this might not justify some statements that are made that you and I would pause and go, "Wait a minute, I'm not sure that's accurate," but he's coming at this primarily as somebody who is a pastor, who is an evangelist to the lost, trying to identify barriers that he thinks his experience and research shows, keeps people from coming to Jesus. I'm with him 100% on his sentiments, but I think there was a lack of clarity and precision that just raises some troubling questions. Scott Rae: I think he's correct, I think, to insist that many have lost faith because of some things that are hard to explain in the Old Testament. The literal creation, for example, how does that square with our understanding of evolution, the phenomena of divine violence in the Old Testament, how it comes out, things like that. This is what I call the phenomena, "Did God really do that," type of thing. I appreciate the sentiment that he's trying to remove the obstacles that keep people from coming to faith and staying in a vibrant faith. Sean McDowell: A hundred percent that's his motivation. I think that's the desire, where he's coming from. I think that's why we need to give him the charity, and the benefit of the doubt, without also failing to critique some of the ideas and lack of precision that I think would be ... It is a little bit troubling and raises some questions. Scott Rae: I think with our notion of thinking biblically about everything, we want to think biblically about the big idea that he was trying to get across, that the church needs to unhitch itself from the old testament. The message has sort of sent, I think, understandable shock waves through the Messianic, Jewish community, which is why we've asked our friend, Mitch Glaser, to come join us today. Mitch, you've heard the sermon that Andy preached about the need for the church to unhitch itself from the Old Testament. What was your reaction to hearing that message for the first time? Mitch Glaser: Yeah, thanks and thank you, Scott and Sean, for having me on the podcast. I'm a very proud Talbot graduate and had Dr. Charles Feinberg as my professor years ago. I'm wondering what he would have thought about some of these messages. He would have had quite the response. I think that Andy Stanley is articulate. I think that he's a missionary pastor. I actually listened to all three aftermath videos, and I also- [crosstalk 00:05:56]. Scott Rae: That's the sermon series that this message was the finale of? Mitch Glaser: Yeah, and so you have to do a couple of things. You have to set the context for everything. Number one, he's speaking to mostly Gentile, thank God a lot of young people, but he's speaking to a lot of Gentile young people who have very little familiarity, probably, with the Old Testament, with Judaism and first century Jewish culture, and they're facing sort of the onslaught of the secular world. Most of them are not in ministry, they're in business, and school, and in everyday life they're trying to handle the gospel and reach their friends, and neighbors, and families. So, that's number one, he's speaking to a particular audience. I think when we remember that, it really helps us. Mitch Glaser: So, I think that, when he says that we need to unhitch ourselves from the Old Testament, there's no doubt in my mind that Andy Stanley believes in the inherency and authority of the Old Testament. What Andy Stanley seems to be describing is two things, one, I think you guys are absolutely on target that it has to do with apologetics and polemics. So, basically Andy Stanley has found the Old Testament to be more difficult to defend than the New Testament or the person of Jesus. Mitch Glaser: I would, actually, take that one step further, because he does. I think that when you think through the title of the series, it's Aftermath. Well, the aftermath of what? Well, it's the aftermath of the resurrection. Basically, this is his post Easter series. Stanley is arguing, or something, very clear, and that is that you shouldn't base your faith, or try and defend your faith, on the integrity, and relevance, of an ancient book like the Old Testament. Of course, I would think the New Testament is pretty ancient, too, but the Old Testament. Mitch Glaser: There's a lot of difficult things to defend. There are ethical issues. He quotes Sam Harris and Richard Dawkins, and their attacks on the integrity, particularly, of the Old Testament, and some of them are pretty tough things that they say. I think it was, particularly, Sam Harris who Stanley quotes who, as one of the new more vocal atheists, views the God of the Old Testament as a moral monster. Stanley's trying to give his young Gentile congregants a way to defend the faith without having to justify their belief in the Old Testament saying, basically, your faith should not fall and rise on this book. So, he says, really what this is all about is the resurrection, and so don't try and defend the Christian faith based on defending the Bible, especially the Old Testament. Unhitch yourself from it and, as he said so eloquently, "Our faith stands on two nail-pierced hands." Forgive my New York accent. Mitch Glaser: Basically, Andy Stanley is arguing for building our testimony, and our faith, on the basis of the resurrection, as opposed to building it upon the Bible, and I think that's pretty accurate from what he said. It's not simply an unhitching us from the Old Testament but, rather, hitching us to the resurrection as the key point of evidence, and the foundation for our Christian faith, and Stanley feels that for his audience that will be more defensible than trying to defend the Old Testament, everything from creation to little details in the law, he pokes fun at some of the statements in the law, and so on. I think that's really what a lot of this is about. I think he is polemically driven by caring for his audience as a pastor, and trying to give them tools to defend the faith in a secular, modern world. Sean McDowell: I think that's a very charitable read, and often for me in apologetics if people bring up, "Are there contradictions in the Bible, or did evolution happen?" I'll often say, "If Jesus rose from the grave Christianity is true. Let's keep the main thing the main thing," but I don't know that I would use the term unhitch from the Old Testament. I think it brings some baggage that would concern me as a believer. Tell me what your concern would be given the charitable reading that you have, assuming that you have one, framing this as unhitching the faith from the Old Testament. Mitch Glaser: Let's stick to apologetics for a moment, because I think that was one of his major concerns. I don't think he was really worried about the kids in his church beginning to keep kosher, which is very hard to do with all the good barbecue in Atlanta. I don't think that was the issue. But, here's what he misses. First of all, I congratulate Andy Stanley on being an expository preacher. I mean, he really goes through the texts, and as he's going through Acts, chapter 2 and Acts, chapter 3, and then Acts, chapter 5, and previously going through Luke, as he's really going through these passages trying to talk about the power of the resurrection, I think his argument would be strengthened, actually, if he hitched himself to the Old Testament, because he seems to not totally recognize that the Apostle Peter in preaching about the resurrection actually is quoting from the Old Testament. Here we have the polemical power of predictive prophecy. How's that for Ps? Scott Rae: You can close in prayer after that, too. Mitch Glaser: I was going to take the offering first. The beauty of reading the Old and New Testament together is one uninterrupted story, seeing the fulfillment of God's Old Testament prophecies fulfilled in the life and work in Jesus, which tie together Isaiah 53, which portrays both the person and work, the death and resurrection of Jesus in one passage. By tying that together with the empty tomb and the words of Paul in 1 Corinthians 15, by taking Psalm 16, which Peter clearly quotes from in his sermon in Acts 3. I think it's Acts 3, not 2. By even tying together in Acts 2 the pouring out of the spirit in Joel, chapter 2, you see that on, and on, and on he's quoting the Old Testament and, basically, you have to remember that Peter is Jewish, the disciples were Jewish, Jesus was Jewish. Mitch Glaser: Even though Stanley said a number of times that they did not have the Bible, because the Bible was not created until the fourth Century. That's an issue involving the development of the canon. I would say that clearly the disciples, and Jesus Himself, did have a Bible. They had the first half, the lengthy half, that they had the Bible, and that the canon was already determined within Jewish society, and there wasn't much change to the canon when, eventually, the ecclesiastical authorities in the fourth century deemed the Old and the New Testament as canon. They didn't create the canon, they accepted the canon that was already in existence. The canon includes predictive prophesy. Mitch Glaser: Now, when you take your average secular person, they don't even have to be Jewish, although with Jewish people you got to prove that the Old Testament said it and the New Testament fulfilled it if you're gonna make any headway, particularly with millions of religious Jews. You can't possibly convince them that Jesus is Messiah without looking at their authority. So, it's very important to understand the value, and beauty, of the unity of scripture with promise and fulfillment, promise in the old testament, fulfillment in the new, and that has persuasive power. Mitch Glaser: If I were speaking to Andy Stanley, which maybe one day I will, I would say, "Brother, I'm all for the resurrection. I think it's powerful. I don't think that we experience the resurrection today the same way Peter, or the disciples, experienced it. In fact, we read about it, we believe it, we accept it, and we proclaim it." It's not a first-hand experience. I know that ... Somebody says, "How do you know Jesus is the Messiah?" I can use an existential argument and say, "I know he's the Messiah, because I just spoke to Him." I understand that. Moses could have used the same argument with God, as well. Scott Rae: It is, Mitch, an interesting part of this I think ... I just opened to Acts, chapter 3 and, I think, your point about the explicit link with the Old Testament, I mean it's all over Acts, chapter 2 when Peter is preaching at Pentecost, but in Acts, chapter 3 the link is made even clearer where in Acts 3:13, "The God of Abraham, Isaac, and Jacob, the God of our fathers, has glorified His Servant Jesus," and then he goes into the message of the resurrection after this. It seems sort of explicitly in continuity with what had been revealed and predicted in the Old Testament. Tell us just a little bit about, what has been the impact of Stanley's message in the Messianic community? Mitch Glaser: The Messianic community doesn't quite know how to handle it. I think a lot of them don't know Andy Stanley. They've never heard him preach before. I read his discussion in Relevant Magazine the other day, as well, and he made himself very accessible and very approachable, and so I think that will be good for the Messianic community. He said he will pick up his phone, he will answer an email, and I think that's wonderful. I would encourage the Messianic community to speak directly to Andy Stanley and find out what makes him tick, and find out why he said what he said. To go on just a little bit more, Scott, if I could, so I think the general feeling is the Messianic community is somewhere between mystified and upset. They just don't know. It feels like Andy Stanley is demeaning the Old Testament. Let's talk about the theology of this just a little bit. We understand in putting together the Old and New Testament, you've had lots of heresys throughout the years, from Marcion on down, and I think to call Andy Stanley a Marcionite is ridiculous. Sean McDowell: I agree with that, by the way. Scott Rae: Tell our listeners what Marcionism is just briefly. Mitch Glaser: Well, Marcion was a second century, I believe, church father who, basically, did not appreciate the material world, associated the Old Testament with the material world and, basically, rejected the Old Testament as being overly material, concerned with land, and people, and all sorts of things like that. The church, basically, considered Marcion a heretic. Anybody calling Andy Stanley a Marcionite is calling him a heretic, which is absolutely ludicrous. Mitch Glaser: That would be an overreaction. What I would say is that Andy Stanley did a good job on Acts, spoke a lot about Paul but, again, he's addressing an audience, and if I were him I would take another look at 2 Timothy 3:16, to see how this passage might inform his next sermon series where he talks about the Old Testament, and he did say that there would be more coming in his third video. So, 2 Timothy 3:16, Rabbi Saul, you know the Apostle Paul, writes "All scripture," using the Greek word graphḗ, which was a reference to the Old Testament since it was the only canonical corpus of holy documents and scripture there was at the time, so "All scripture," op'neu-stos, "inspired by God," so it's God breathed, "and it's profitable for teaching," or doctrine, "for reproof," telling you what's wrong, "for correction," telling you what's right, "and for training in righteousness," from the Greek word, as you know, paideia, which is training a child. You cannot preach grace in the New Testament without understanding the Old Testament. You've got to preach them both. Mitch Glaser: Let me take it one step further. Now, let's look at Andy Stanley, the evangelist. If I was going to say, "Brother, there are a few other things that might help you," I would refer him back to John, chapter 5, where in verses 45 through 47 Jesus Himself, quite an authority on the Old Testament, I would say, says, "Do not think ..." He's saying this to Jewish people. "Do not think that I will accuse you before the Father. The one who accuses you is Moses, in whom you set your hope, for if you believe Moses, you would believe me, for he wrote about me, but if you do not believe his writings how will you believe my words?" If you unhitch the gospel, or Christians, from the Old Testament, how will you ever show Jews and Gentiles the nature of sin? If you can't show them sin then why bother with the power of the resurrection. Mitch Glaser: Now, you might say, "Well, that's Jesus and that's directed to Jewish people," but then you just flip back over to Paul who said two things. One, in Romans 7:12, He said, "So, then, the law is holy and the commandment is holy, and righteous, and good." So, even though Andy said the 10 Commandments are not your commandments, well, I don't think it's true, but I understand where he's trying to make sure that these young people know how to work their way through the Old Testament, and he's right in a sense, because if it's not in some way all yours then none of it's yours, and I would be one who would argue that it's all yours, and 2 Timothy 3:16 gives Christians the guidelines on how to utilize the Old Testament. Mitch Glaser: But, one of the ways we utilize the Old Testament is to demonstrate that people are sinners, so the law is holy and the commandment is holy. How can you demonstrate somebody is a sinner when you can't talk about the 10 Commandments, and then you have Romans 3. In Romans 2 and 3, Paul delineates special and general revelation, special revelation for the Jews coming through the law, general revelation coming through what, through creation. How do you even know God created the heavens and the Earth if you don't have Genesis 1, and 2, and 3, and you don't have a fall. So, I think that trying to present the good news of the gospel, and God's love and grace, without leaning on the Old Testament scriptures makes things more difficult than God ever intended, and it's worth the effort to try and explain some difficult passages, because the bible, including the Old Testament, is inspired, inherent, and is good and profitable for our use. Sean McDowell: Mitch, I think that's beautifully stated. I was recently reading a new commentary by a Jewish talk show host, Dennis Prager, and he said, "It's important to believe that the Bible is inspired, because if I think it's divine then it makes me realize it doesn't have a human source and drives me to find a reason and a basis, even for some of the difficult teachings in the Old Testament." Of course, he's coming at it differently than we are, but I thought that was a beautiful way to remind us of the value of the Old Testament in so many ways still today. Sean McDowell: Let me ask you this. So, the Old Testament helps set up the nature of sin, the nature of the gospel, who Jesus is, but what about the laws, are they still relevant, none of them, all of them, some of them? I know this is a huge question but, how should we approach some of the laws we see in the 10 Commandments and beyond? Mitch Glaser: Let me start again with 2 Timothy 3:16, all of God's revelation, graphḗ, is good for us, and so we need to start with the fact that it is relevant. I love it when some Christians say to me, "Well, you're a Jewish believer, does that mean you're under the law?" I then say, and this is why it's not quite an all or nothing thing, but it's an important discussion because what does it mean to be under the law? It means that I believe that the Old Testament has authority and that it's God's word and that somehow in some way I need to be obedient to what God has revealed both in the Old and the New Testament, and so I would say that there needs to be a distinction made. Mitch Glaser: This is where I think Andy Stanley is preaching in a popular way. He's very excellent. He's quite the preacher, and he uses a lot of rhetorical devices. He uses hyperbole. We all understand that. We all do that as preachers, too. But, in speaking to his crowd, he did not make a distinction, Sean and Scott, between the Old Testament law, the Mosaic law, the legal corpus within the five books of Moses, and within the books of the Old Testament, and so if I was to just listen to Andy Stanley, and I'm sure he doesn't mean this, if I was to just listen to him, because of his rhetoric and hyperbole, and because he's addressing his audience, I would say to myself, "Wow, is he saying that we not only do away with Genesis but we do away with Psalms, and Proverbs, and the Song of Solomon, and Isaiah, and Jeremiah, and the history books, because he keeps talking about the law and the prophets. In Judaism we call it the TaNaKh, Torah, Nevi'im, Ketuvim, total of five books; Nevi'im, the prophets; Ketuvim, the writings, and so does that mean we just sort of get rid of Ezra and Nehemiah, and so on. Of course, he doesn't believe that, but one could get the impression of that. Mitch Glaser: Paul explains in Galatians and in other passages, and Christians go back and forth on this, on what our relationship is to the legal corpus in the law, so that's one thing. What about the Christian's relationship to the rest of the Old Testament, because he uses the two synonymously? When I was at Talbot I did my Masters Thesis, we still had theses in those days, I did it on the synonyms for Torah in Psalm 119. What I discovered, basically, was even within the corpus of the law ... I know a lot of people talk about civil, ceremonial, and moral laws, the tripartite sort of division of the law. Actually it's much broader than that, and so the different terms in Psalm 119 refer to different corpuses within legal corpuses within the law. I would say that Jewish people, even today, are still under the Mosaic covenant, and that's another problem, he doesn't distinguish between Mosaic law and Mosaic covenant. Mitch Glaser: I would say that at the least Gentile Christians are to live their lives in conformity to the lessons learned from the narrative portions of the Torah, and from the entirety of the Old Testament. If not, then 2 Timothy 3:16 doesn't make any sense, and Christians are the poorer for it. That would include lessons learned from the 10 Commandments. Scott Rae: Okay, Mitch, thank you. That's, I think, a really helpful clarification just to help the church today understand what its relationship is to the legal corpus, as you describe it, the law of Moses, the regulations. Mitch, I think this has been really helpful to get ... Your perspective on this, I think, is particularly beneficial for us, since you spend your life working with the Jewish community, and Chosen People Ministries it's mission is to win the Jewish people to faith in their Messiah, Jesus. We really appreciate the perspective you've brought to this, and I think particularly the suggestion that you made to help strengthen the evangelistic and apologetic thrust that we know Andy was trying to get at in these messages. We're very grateful for you taking time to be with us today and for your insight. Scott Rae: This has been an episode of the podcast think Biblically, Conversations on Faith and Culture. Our guest, Dr. Mitch Glaser of Chosen People Ministries, delighted to have had him with us. If you've enjoyed the podcast today, give us a rating on the App with which you listened to the podcast and share it with a friend and, remember, Think Biblically about everything.